South Africa is a very big country so it’s sprawling, breathtaking landscapes are best enjoyed from the window of car while on one of its famed road trips. Of all the long drives that you can take, the South Africa Garden Route is easily one of the best. 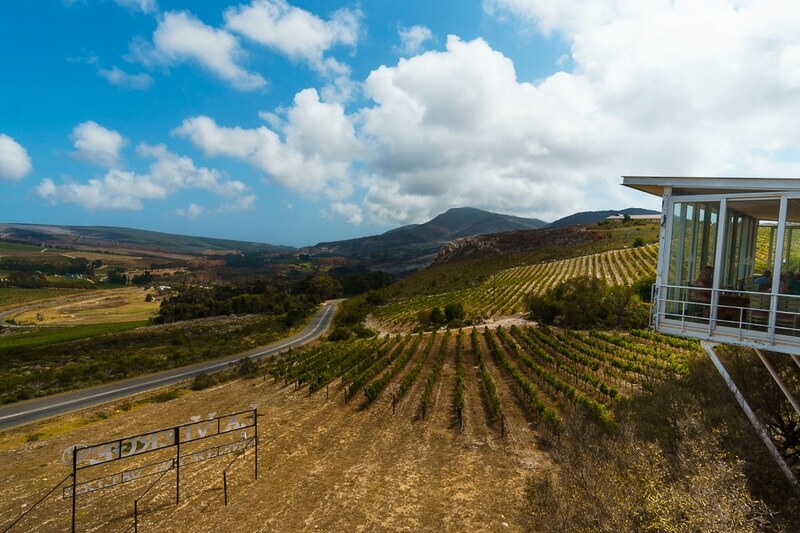 Spanning between Cape Town and Port Elizabeth (or vice versa), the road winds through multiple nature reserves, rolling hills, and vinyards while meandering alongside rugged coastlines and gorgeous beaches. There are also several wildlife sanctuaries and farms where you can see birds in the largest dome aviary in the world, hang out with monkeys, or elephants, ride an ostrich, or tour museums dedicated to South Africa’s history,. 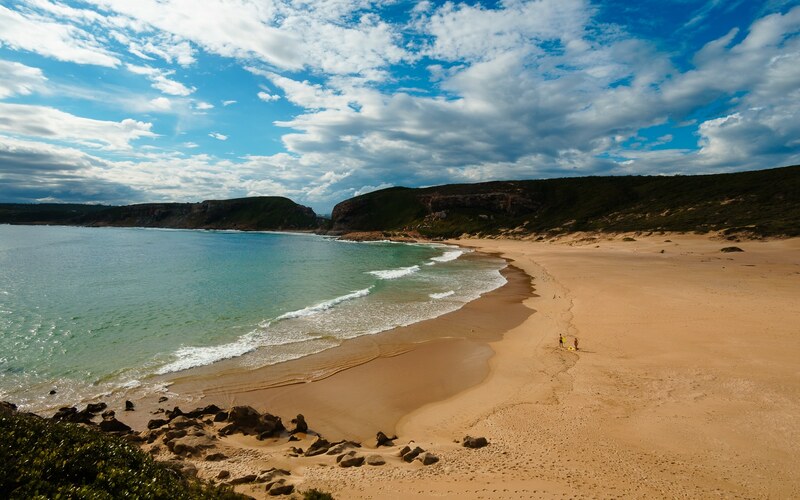 Whether you’re looking for some lazy beach days, wildlife encounters, or to get out and explore some of the best natural areas that South Africa has to offer, there is an itinerary for everyone along the Garden Route. 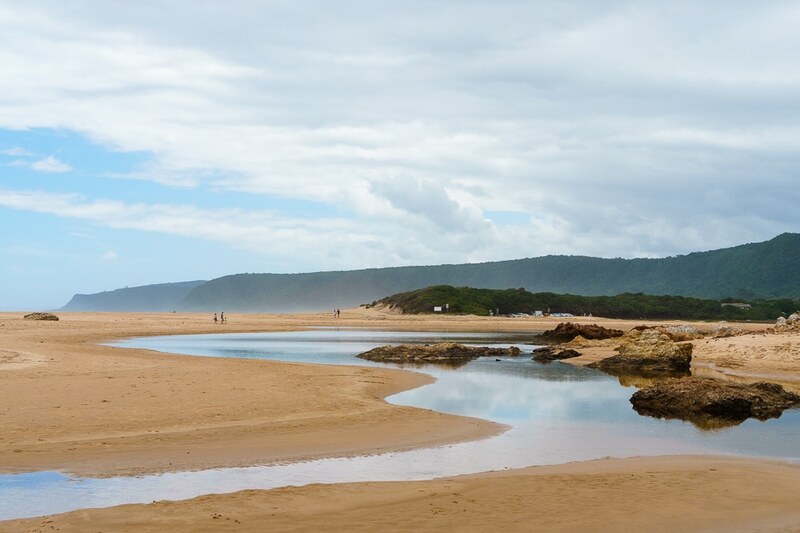 The Garden Route follows the 300m coastline between Mossel Bay and Plettenburg Bay while crossing through wetlands, forests, rivers, beaches, mountains, lakes, and fynbos (a small belt of shrubland) in the Western Cape . 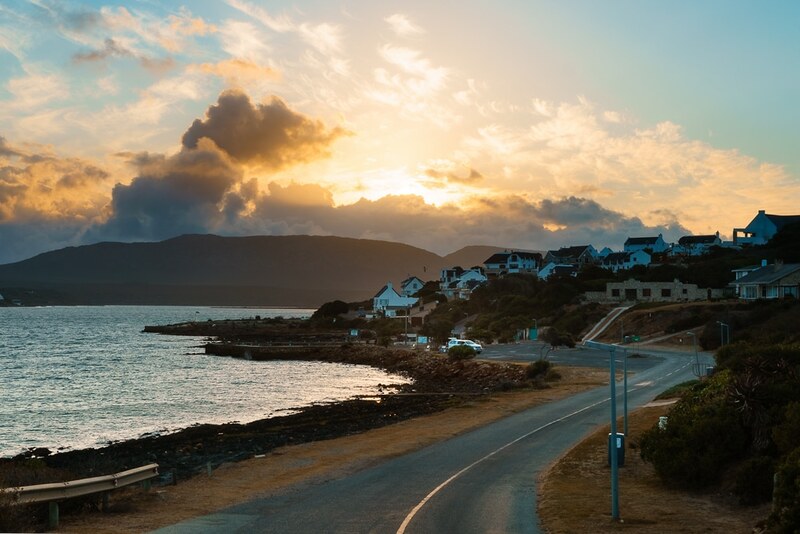 While it doesn’t officially start until after about 4.5 hours of driving from Cape Town, the scenic drive commences straight away, especially if you take the R44 “Whale Route” toward Hermanus and Gansbaai. Depending on which city in South Africa you fly into, you can either drive the Garden Route from the Eastern Cape city of Port Elizabeth to Cape Town or vice versa. We don’t recommend trying to start from Johannesburg since the drive will be insanely long and dull until you get to Port Elizabeth. If you fly into Johannesburg, you can take a short flight to Port Elizabeth or take an overnight bus with Intercape. If you have already been to Kruger National Park and/or Johannesburg, then we recommend going from Port Elizabeth to Cape Town. 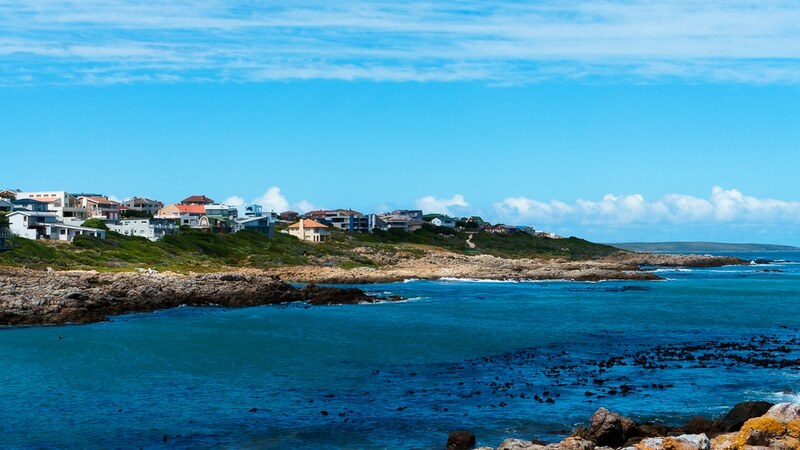 This way you end on a very high note since Cape Town is so immensely beautiful and there are lots of things to do around there too, such as see the cute penguins at Boulders Beach, tour Cape Point, and visit the colourful beach huts of Muizenburg. Renting a car in South Africa is easy and for the most part, driving there isn’t too difficult. Of course, unlike most of the world South Africa drives on the right instead of the left so that takes a bit of getting used to. Most rental cars are manual transmission so if you need an automatic you’ll likely have to pay a little more. Even if you are used to driving a standard, keep in mind that everything will be on the opposite side of the car and that will take some getting used to. Since we felt like getting used to driving on the opposite side of the road was enough of an adventure, we sprung for an automatic and would recommend that. Roads along the Garden Route were in good shape for the most part, so a small car is all you should need. Depending on what route you take, you may encounter some gravel roads. It wasn’t as much of a problem on the Garden Route, but some of the roads between Johannesburg and Kruger had absolutely monstrous pot holes so keep your eyes peeled for them. In general, you’ll likely find the best price while searching online using something like TripAdvisor or Expedia. Be sure to check that whatever company you end up using has roadside assistance in case you have any issues with the car. Also, go look at Facebook, Google, and Trip Advisor for the company and read reviews. Many car rental companies in South Africa claim “damage” to otherwise perfect-looking cars if you decline their astronomically priced in-house insurance and there is a deep trove of horror stories to be found on the internet to that effect. It also happened to us when we booked with Avis/Budget for our Kruger National Park trip. Our bill ended up being 8 TIMES what our quoted price was. No joking. We were slightly annoyed with this because we provided documentation of our own insurance when we picked the car up. Nevertheless, we got in touch with their customer service department who informed us within a couple of days that if we sent the proof of insurance again, they would refund the fee. That is what customer service should be, so we are still comfortable recommending EuropCar for a good budget option in Cape Town. Be sure to book with a credit card that has good insurance too. Also, if you’re driving the Garden Route one-way you can expect to pay more for dropping the car off at a different place than you picked it up. Lastly, photo radar is widely used in Cape Town, along the Whale Route and, and on the Garden Route. If you get a ticket you’ll have to pay that and the rental agency will likely tack on an “administration fee” as well. The speed limit on South African roads seems to fluctuate wildly and signage is a bit lacking at times, so if in doubt, take it easy! Traffic accidents are probably the biggest threat to safety along the Garden Route, but the roads are typically well maintained and there is no need to rush. In fact it’s better if you don’t because you’ll be able to soak in the beautiful sights more easily! 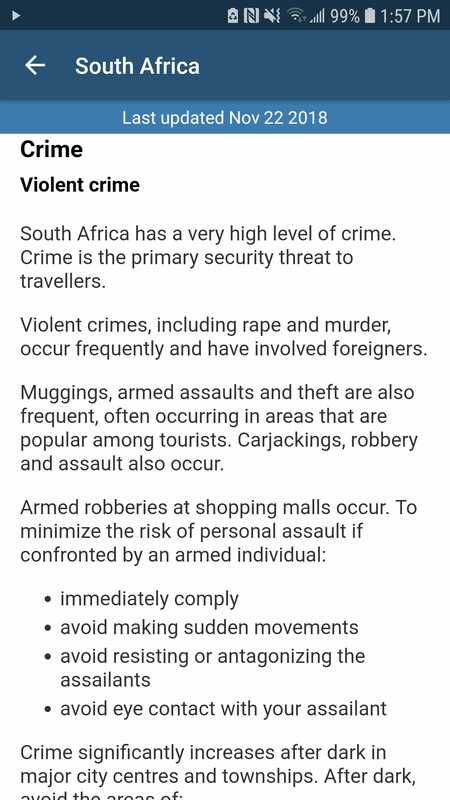 A lot is made of crime in South Africa and the warning that the Canadian government gives travellers makes it seem like you’ll be sure to be the victim of some horrible crime if you go, but it’s important to remember that these situations are the exception and not the rule. If you stick to the touristy areas in South Africa, such as the Garden Route and exercise caution you will hopefully be fine. The Canadian government did a good job of scaring us before going to South Africa. That said we were warned that “smash and grab” car break ins are possible so keep all belongings in the car hidden from view. Locals told us that people will break in to your car even if all they see is a few small coins or a cheap pair of sunglasses. If you park at a beach or restaurant, there is usually a person wearing a visibility vest that will keep an eye on your car for you. Tip them a few rand for their services and everyone will be happy. Plan your drives so that you’re on the road during the day and off the road at night as most long distance trucks and buses take to the road at night. We found that it often took longer to drive than the distances listed in tourism information and in Google Maps so be sure to plan for extra time to get from point A to point B. You never know when you’ll want extra time to stop for photos, or when you’ll encounter (as in our case) a detour due to a surprise closure of the N2 for maintenance. The urban myth of not stopping at red lights in South Africa is just that, a myth. If you don’t feel safe, stop, and then proceed cautiously through the intersection so that you don’t find yourself in a traffic accident. It is a good practice to keep your doors locked at all times, not just to prevent theft from people, but also from baboons as some are smart enough to pull on the door handles! You’ll encounter folks driving at every speed imaginable (from 150+ km/h to less than 30km/h on the same road. South African drivers will often move on to the left shoulder to allow others to pass when it’s a single lane. Use caution when passing in these situations and be sure there are no oncoming vehicles. You should have cell service along most of the route (we used Vodacom) and gas stations are plentiful so you should not find yourself stranded too easily. We travelled the Garden Route during South African summer which is Mid-October to Mid-February, specifically we went during early February. The weather was gorgeous, sunny and hot so it was great to have plenty of patios and beaches to enjoy. Some people recommend travelling there in September and October when the fynbos flowers are blooming and the weather is warm but not too hot. If you leave from Cape Town, the Garden Route overlaps with the Whale Route so if whale watching interests you, the best months are from June to November. The weather may be a lot cooler and wetter but you can sit at any of the cute seaside coffee shops along the way and watch whales go by. How long does the Garden Route take? People can drive the Garden Route in as few as 3-4 days, but we feel like you would be missing so much if you rushed it. We took 9 days and even then we ended up wishing that we had more time. There are simply too many great things to see along the way. Take as much time as you can! We stayed in Hermanus, Witsand, Mossel Bay, Knysna, and Port Elizabeth using a combination of places on AirBnB and Booking.com. Other popular stops along the way are Gansbaii, Geroge, and Plettenberg Bay. There are lots of beautiful, comfortable, and affordable accommodation options and we felt that we got tremendous value for our lodging along the Garden Route. If you have camping gear, there are many places to camp along the way and some of the campsites such as the ones at Wilderness and Nature’s Valley were stunning. If we were to make the trip again, we would definitely bring our own camping gear and do it that way. No need to worry about roughing it as most of the campgrounds have showers and other amenities. Some even offer bungalows and huts instead of tent camping, but they tend to book up fast. Reservations can be made at SA Parks. Now for the fun part! Planning your trip along the Garden Route should be a blast since there are so many beautiful places to stop along the way. Buckle up, you’re in for a real treat! We’re going to detail our route from Cape Town to Port Elizabeth but as mentioned earlier you may want to reverse this route and finish on a high at Cape Town. 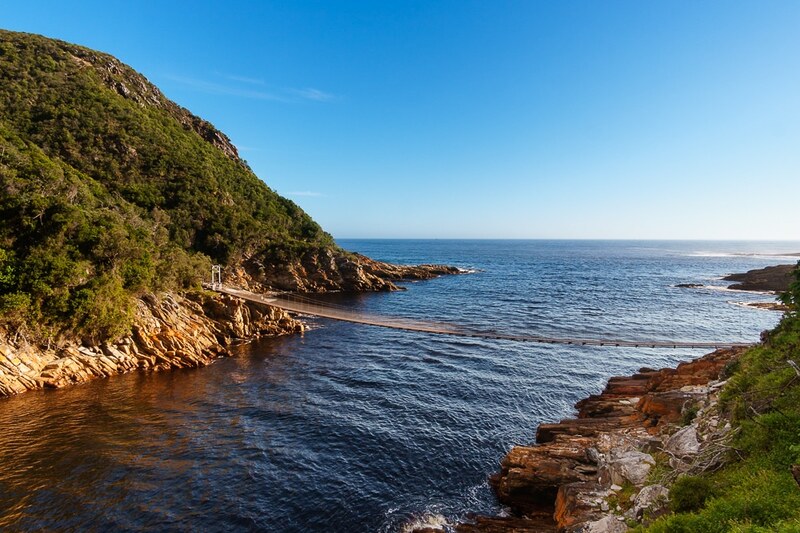 Since we love hiking and the great outdoors, we geared our trip toward hitting up some of the amazing parks and nature reserves along the way but if that’s not your thing you can always B line it along the N2 highway to where the Garden Route’s contested start is around the small city of George and enjoy the beaches and beautiful restaurants with a view. If you’re leaving from Cape Town, we recommend making your first stop in Hermanus along the R44’s Whale route. We stayed at a great little AirBnB where the owner also offers very affordable surfing lessons at about $35usd per hour. So if surfing is something that you’ve always wanted to do, this may be a great place to try it. 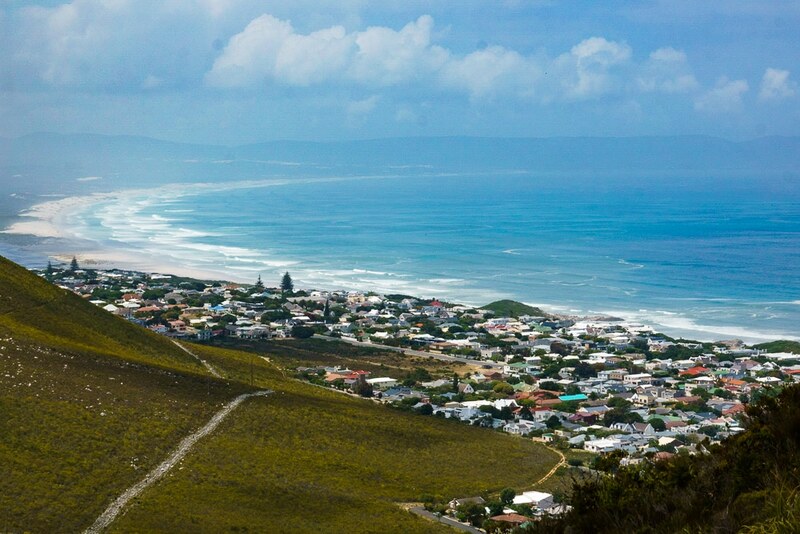 Hermanus has a lot to offer and we recommend spending at least 2 days there. That said, if you plan to go Shark Cage diving you may want to continue on to Gansbaii for your first stop. 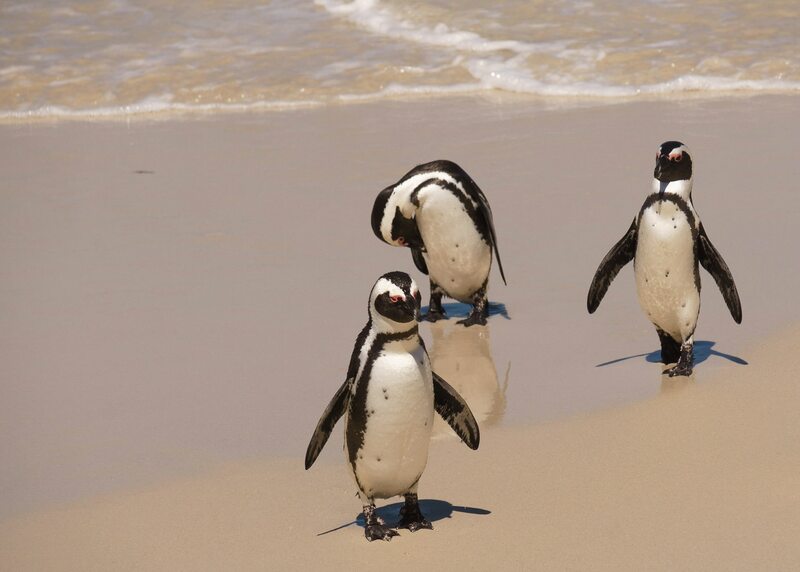 Also, if you’re not going to see the beach dwelling penguins at Boulders beach which is west of Cape Town, then you can stop at Betty’s Bay on the way to Hermanus and see them there. Fernkloof Nature Reserve is a short drive from Hermanus and offers some great hikes through fynbos to a gorgeous view of Walker Bay. Entry is free although we recommend contributing to their donation box to help maintain the park. 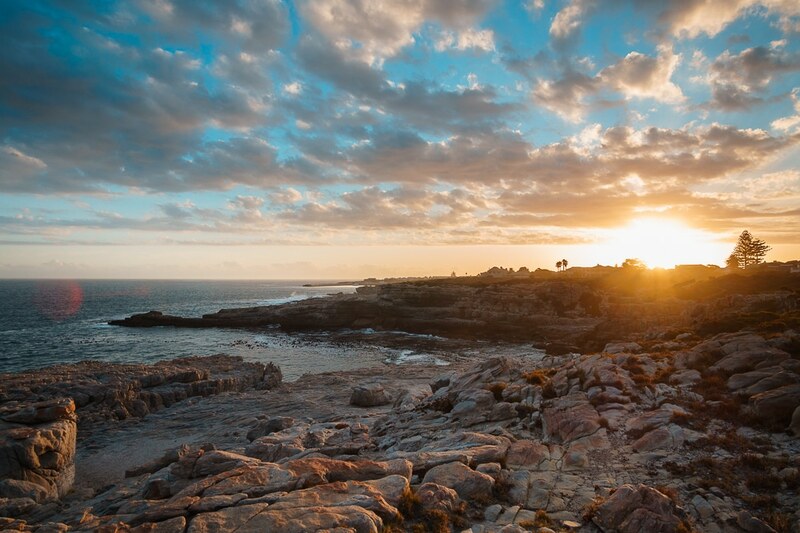 Hermanus also features a 12km cliffside walk that is an amazing place to stroll along and take in the sunset with your favourite sundowner. Unfortunately, we read that there have been muggings on the paths in the past, but when we went there were multiple security personnel patrolling so you may just want to avoid lingering too long after dark. The views are absolutely worth it and during whale season (June to November), a “whale crier” walks along the pathway sounding his horn when he spots whales from the cliff. (Seriously, how cool is that?) Although Hermanus was only our first stop along our road trip to the Garden Route, we had already decided that we would come back to South Africa during whale season. Who are we kidding, we pretty much had decided that during our second day in Cape Town, South Africa is just that enchanting! There are also quite a few wineries in and around Hermanus. We liked Whale Haven for their delightful patio pounders (aka the perfect wine for a hot, sunny afternoon spent on a patio). Definitely splurge for the wine and chocolate tasting too. We also checked out La Vierge but found their tasting prices to be more Napa Valley than South Africa. The restaurant was more reasonably priced though, and the views were incredible. We also saw our first gorgeous blue cranes while enjoying lunch there! 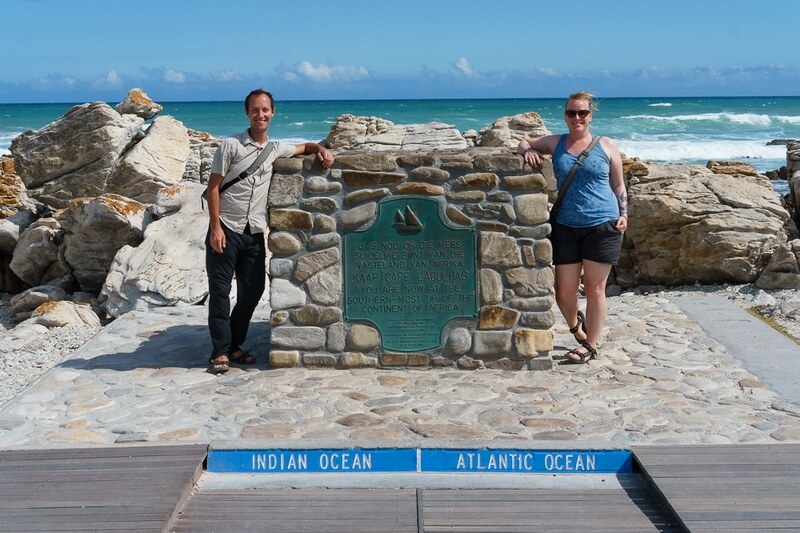 From Hermanus, we headed along the R43 coast road to the tiny town of Witsand with scenic stops planned at Gansbaai (the shark cage diving capital), and L’Aguilas which is the true southernmost point of the Continent of Africa. Truth be told, it was not as impressive as Cape Horn which is the southwestern most point that’s about 40 minutes from Cape Town, so were we to recommend visiting only one, it would be Cape Horn. Seriously, it took our breath away and almost blew us away with the gale force winds at the top of the lookout. While on the way to Witsand, we ate lunch at what was one of our favourite places along the way, Sea Shack Strusbaai. It’s a restaurant right on the beach that serves up fresh and tasty seafood with a view. If you plan ahead, you can also arrange a delicious sounding braai. We were not so organized so we enjoyed some of the best calamari ever, a delicious fresh salad and tasty fries. The portions were huge, prices were very reasonable, and we appreciate their efforts to reduce single-use plastics. Witsand itself is pretty tiny and there’s not too much to do other than enjoy the namesake white sand beaches and dine along the river at sunset. Just watch out for the rather bold Egyptian goose that will nibble at your backside to get you to drop some food for him at Pili Pili! The sunset from Pili Pili in Witsand was pretty spectacular! We had intended on stopping at the De Hoop Nature Reserve which is the home of the world famous “Whale Trail”, a gorgeous multi-day hiking trek, to do a day hike, but we missed the turnoff and by the time we realized that we had, it was too late to turn back that day. After making it all the way to Witsand, we realized that in order to go back to hike in De Hoop, we would have to backtrack about an hour and a half on a gravel road the next day before heading to Mossel Bay. Since Mossel Bay is supposed to one of the more picturesque towns along the route, we didn’t want to rush and had to reluctantly skip De Hoop this time. Don’t make our mistake if you’re planning to try to stop in De Hoop. We will be back to hike the Whale Trail one day though. 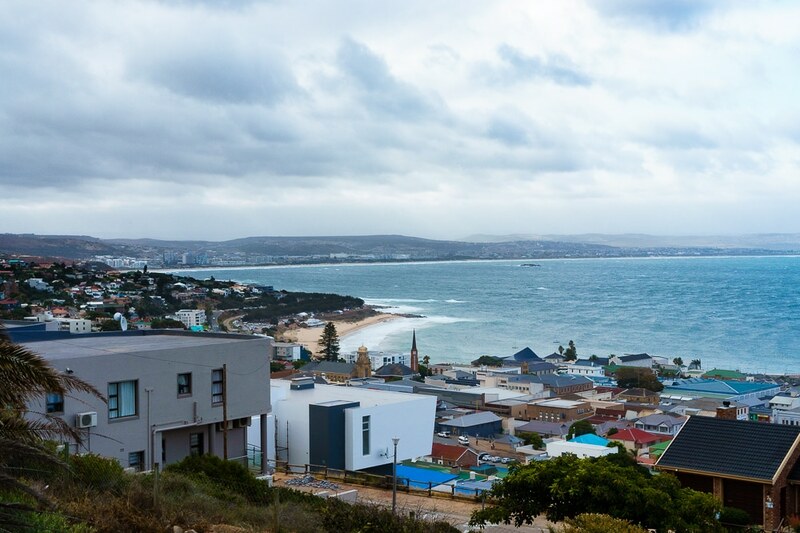 Mossel Bay is a pretty small city with a gorgeous coastline, great restaurants and coffee shops, and some interesting museums. We were sacked from driving and were in awe of the view from our AirBnB so we ended up not exploring it much, opting to cook some dinner and sip wine on the patio instead of going out. It’s a great place to stop between Hermanus/Witsand and Knysna, which is the next big stop along the Garden Route. Our local friends spoke so highly of Knysna that we opted to spend two nights there and we were very glad we did. We took the N2 highway from Mossel Bay to Knysna with a planned stop in the Wilderness area where we we were told there was some good hiking and camping. The hike that we ended up doing was a steep, densely forested one that took us to a mediocre in terms of views lookout. The hike started near the Wilderness camping area and if had we brought our tent or had booked one of the huts ahead of time, this would have been such a beautiful area to camp. The hiking was only so so in our opinions (we’re Rocky Mountain spoiled) but the campsite was gorgeous and located right on the river where you can rent kayaks to tour around and that might be a better activity to break up driving than hiking in this area. Do stop in at the The Blind Pig and Bootlegger Brewery, the beer was delicious and the burger was one of the best we’ve ever had, as in the history of all the burgers we’ve eaten. From Wilderness we pulled into another gorgeous AirBnB with a view and made a nice dinner to eat on the patio while the area got some much needed rain. The next day we headed to the estuary to do some paddling and rented some kayaks from the South African Parks office for about $8cad each which is half of what the private shops will charge. 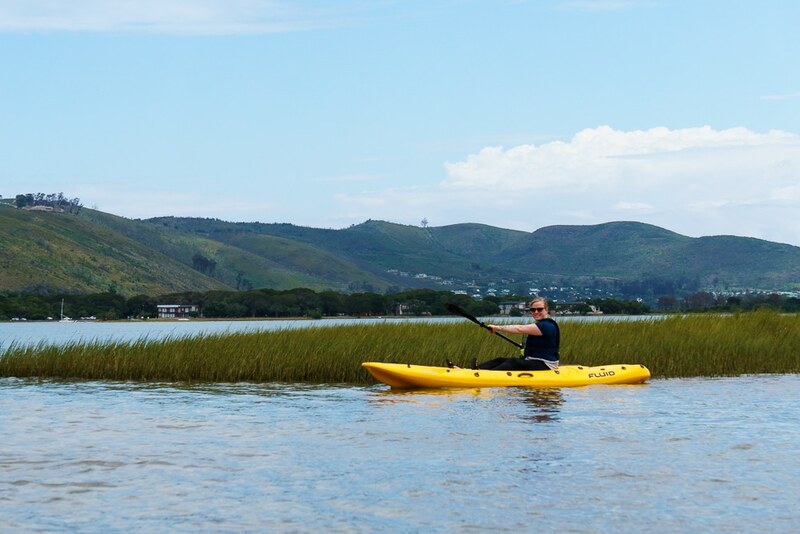 We paddled around looking for the rare, endangered Knysna seahorse to no avail, but did enjoy some beautiful scenery while out on the water. Following that we tried some fresh oysters at Tapas and Oysters before retiring minutes before another rainstorm hit. The following day we drove from Knysna to Robberg Nature Reserve to hike what had to be the most beautiful trek that we did along the Garden Route. The trail climbed up a rocky cliff to offer 360 views of the coast, as well as a seal harem, before descending to a secluded beach. If you have all the time in the world, you can carry onto the lighthouse from the junction to the beach but just the circuit we did was about 10km. As we finished, we were treated to a double rainbow and possibly the blow of a whale out in the ocean. I was told that February wouldn’t be the best time for whales but we may see a few stragglers since it was the end of the season, so when I thought I saw the telltale spout of water out of the corner of my eye I was sure it was a whale. Despite watching the horizon with my binoculars for a while, I never saw it again. After our gorgeous hike in Robberg Nature Reserve, we spent one more night in Knysna before heading to our last stop of Port Elizabeth. We got an early start as we had a few stops planned along the way. 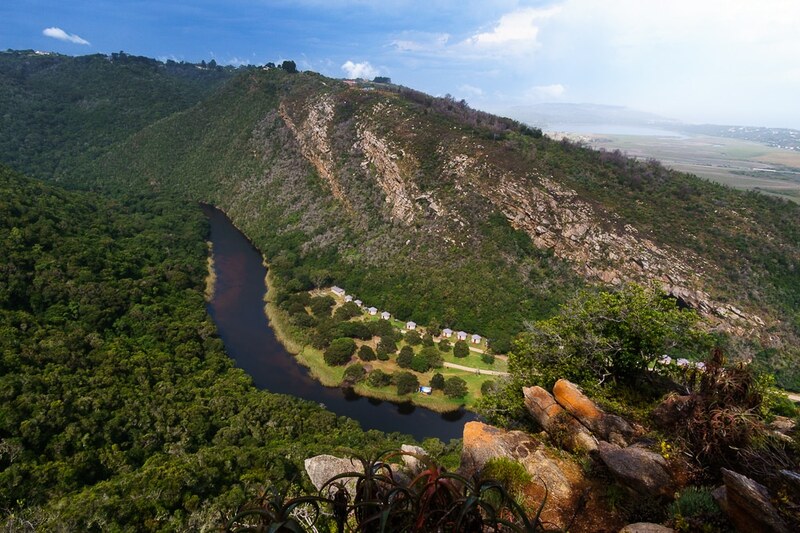 This gorgeous park marks the end of the Otter Trail, which is a multi-day backpacking trail that is considered to be some of the best hiking in all of South Africa. It is an absolutely stunning beach that would be a great spot for a picnic. Unfortunately, the day hikes in the area are not as picturesque as what is nearby and the one we did was probably the worst of all the hikes we went on in South Africa. It began slightly after the campground and followed an old road through dense bush before ending at the beach that we had just driven to an hour earlier. Once at the beach, we opted to walk back along the paved road instead of taking the dull trail back and we were glad we did since it was in the trees along the road that we saw the endemic Knysna turaco. This comically colourful bird is found only in that area and although we got a very good look at it, we did not manage to get a good picture. While I can see how ending the Otter Trail at the Nature’s Valley beach would be an amazing sight, and the campground was stunning, we wouldn’t return for the hikes in Nature’s Valley unless we were doing the Otter Trail itself or spending a few days camping. That said, you can also rent kayaks from the Parks attendant at the campground provided he’s actually there when you stop in. Past Nature’s Valley is a thrilling stop where you can partake in bungee jumping from the world’s highest commercial bridge operation. We balked at the prices and opted to just watch a few people take the plunge, vowing to try it one day when we’re not trying to stretch our travel dollars for another 4 months. 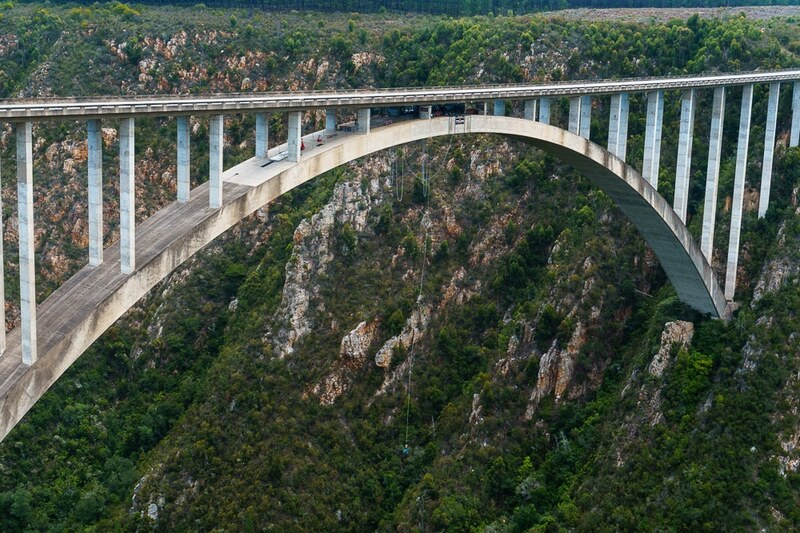 Can you imagine bungee jumping off this bridge? After the bungee bridge, our second favourite hike was the short but sweet one to Storm’s River Mouth. Here you follow a walkway through the forest to a picturesque gorge where the river empties into the ocean. You can also do kayak tours that lead you through the grottos and also include a “lilo” portion where you plank on a board to get through narrow openings. It costs about $70cad per person, again next time for us. Storm’s River is near a cute, tiny town called Tsitsikamma which is somewhere that if we had more time we would have liked to stay longer. At any rate, plan for a short hiking stop at Storm’s River and a visit to the Tsitsikamma Micro Brewery to cool off afterward. 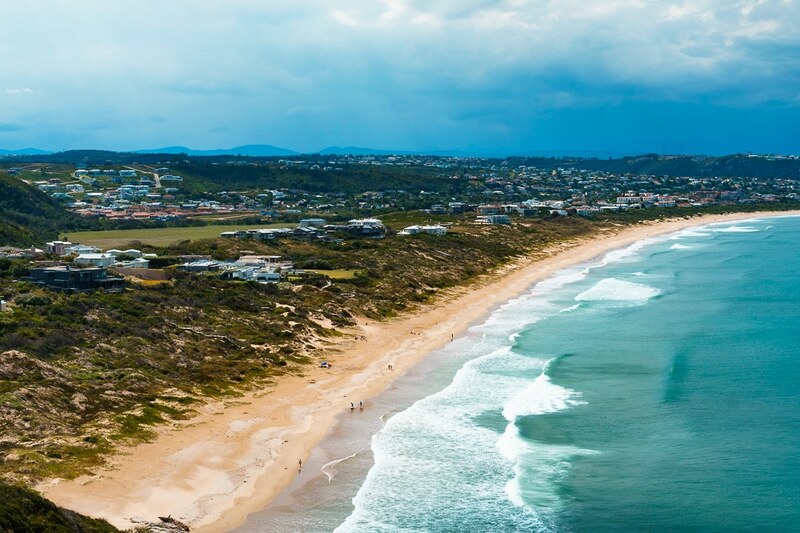 Once you’re in PE as the locals call it, you’re in the Eastern Cape province and outside of the Garden Route. We opted for two nights because we wanted some down time before we got on our 17 hour night bus from PE to Johannesburg, but we didn’t really like it there. Lodging was expensive compared to the rest of the Garden Route and the place that we booked was kind of sketchy. The nearby Cape Recife Nature Reserve was nowhere near as nice as anything we had encountered along the way there. We also stopped at Hobie beach but we felt we had been spoiled by the more beautiful beaches earlier on the Whale and Garden Routes. We ended up just spending a lot of time in coffee shops and at the Bridge Street Brewery. Overall, ending in PE is kind of a sad way to cap off a beautiful trip along the Garden Route, so were we to do it all over again, we would likely start there and end in Cape Town. 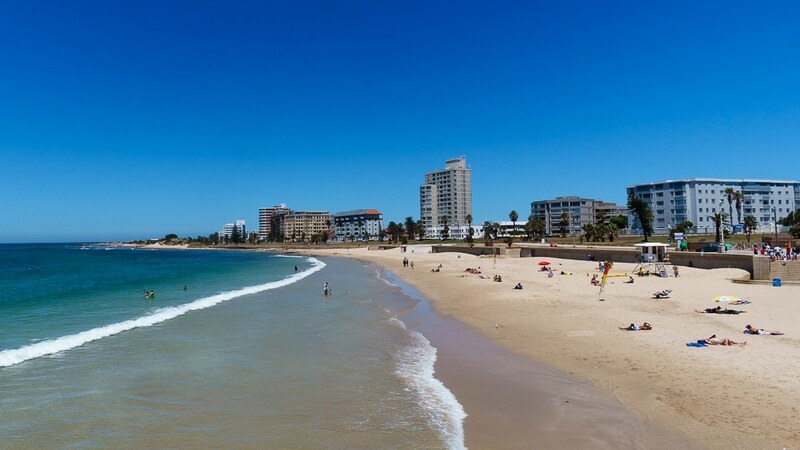 If your budget allows it, we recommend flying to Port Elizabeth from Johannesburg over taking the 17 hour overnight bus, or trying to do the drive yourself. There have been armed robberies on buses in South Africa, so arriving by air is probably safer. Also, be careful where you are dropped off or picked up at the Johannesburg bus station. We were about to walk out onto a dangerous corner to catch our Uber when a parking attendant advised us not to and had us change where the Uber driver should come to fetch us. Once we were safely in the driver’s car, he pointed out a traffic light that is accessed from the second (or first, depending how you count) floor of the bus station rather than the first (or main floor) which is where we exited the station from. The area around the bus station is known to be very unsafe so don’t plan on walking around the Johannesburg bus station. We spent about $130 CAD per day on the Garden Route including our rental car, gas, accomodation, food, and drink. You can trim some money off your trip by sharing a car rental, camping, and self-catering the whole way but we can’t help ourselves from loving a good patio lunch with wine! For the most part our activities were limited hiking and we had a Wild Card to cover our entrance fees. Budget extra if you plan to do any of the pricier activities like shark cage diving in Gansbaii or bungee jumping off Bloukrans Bridge. It is possible to backpack the Garden Route without a car using the hop-on, hop off bus service called Baz Bus. It is kind of like Peru Hop in South America where you can pay for a ticket and jump on and off when you want. This kind of transport is very popular for solo travellers as it is a great way to meet people. The company offers assistance with accommodation and booking tours as well. It does have the drawback that once you reach your destination, it may be difficult to visit some of the Nature Reserves and wineries along the way. Renting a car is often only a little bit more expensive while offering much more convenience and comfort. Is it worth buying a Wild Card? 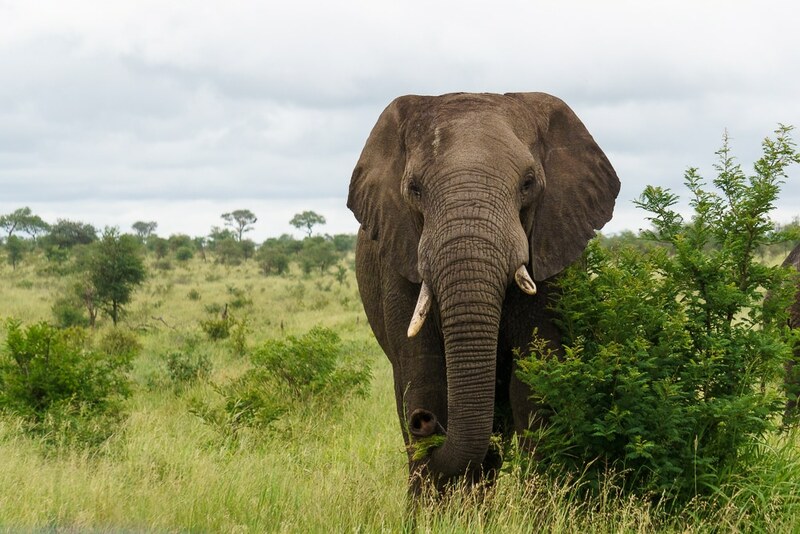 If you’re considering visiting Kruger National Park as well as doing the Garden Route and nature reserves near Cape Town, the Wild Card may be worth considering. 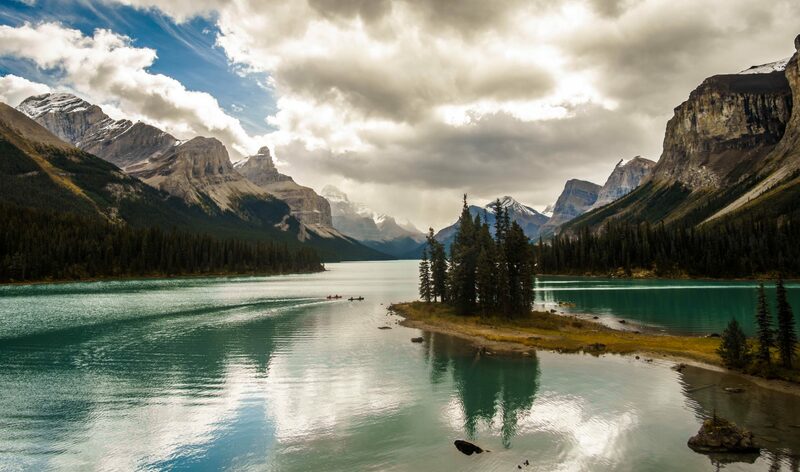 The roughly $450cad price tag may seem steep but it covers entrance fees for two people in most South African National Parks and is valid for a whole year. With entrance fees for Kruger being about $70cad for two people per day, it doesn’t take long to break even on the Wild Card. 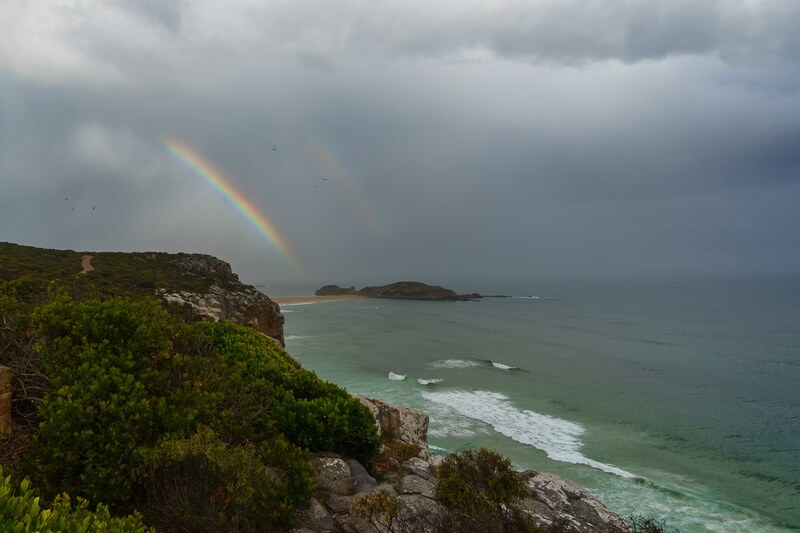 For our trip along the Garden Route and Cape Town it covered access to Table Mountain National Park, Boulder’s Beach, Cape Point, Robberg Nature Reserve, De Hoop, Storm River’s Mouth, and several other parks along the way. We saved about $100cad on entry fees along the Garden Route with the Wild Card so by the time we got to Kruger NP, we only needed about 5 days to break even in the park where we actually spent 8 days. The Wild Card is likely worth it if you’re going to Kruger on your trip as well! Furthermore, it covers park entrances in neighbouring eSwatini (formerly Swaziland). And who knows, maybe you’ll be back to South Africa sooner rather than later since it’s still valid for a year. If you’re going on a road trip, we highly recommend getting a local sim. Some shops will sell a “non-registered” sim which is one specifically made for tourists and you can even pick one up right in the airport. We went with Vodacom and were happy with their coverage. One money-saving tip is to activate your sim with as little data as possible. Then you can go to any shop and buy airtime. For example, if you buy $10cad (or roughly 100rand) of airtime you can load it on your phone and then go to the transfers option and convert it to 1 gig of data for the week for 50rand. I don’t know why, but this is way cheaper than buying 1 gig for a month the outset which is about $30cad. to charge your devices. It is not on most world adaptors so if you arrive in the country without one (like us!) you can easily buy one for a few dollars. If you’re the Garden Route road trip, we also recommend bringing a car charger so you can keep your phone and cameras topped up during long drives. Most of the larger towns along the Garden Route will have multiple options for grocery stores. Pick’n’Pay is a great place to buy groceries with lots of fresh fruit and veggies, good prices, and a great selection of wines for self catering along the way. We found almost every town had at least one Pick’n’Pay. Some of the bigger locations sell hard-sided coolers for about $12cad which are pretty much required for South African road trips. We ended up paying $30cad for ours at Outdoor Warehouse when we couldn’t find a cheaper one on the way out of Cape Town. You may also find a budget cooler at Game, which is like a South African Wal-Mart and is also where we found our cheap tent for Kruger National Park. Woolworth’s is good for groceries and the quality is very good, but you will pay a lot more there than you will at Pick’n’Pay. (It’s kind of like a South African Whole Foods) One thing we do recommend getting at Woolie’s over Pick’n’Pay is biltong, which is kind of like jerky but better. Their branded biltong is seriously delicious and a great road-trip snack, as is their organic wine (for after you’re done driving of course). Go Drive the Garden Route! So there you have it, this post should be a good place to start for planning the Garden Route. Of course there are so many combinations of things that you could do or places that you could stay along the way, depending on your likes and interests. South Africa is home to some of the most beautiful scenery in the world and there’s a trip along the Garden Route for everyone’s interests so get out there! 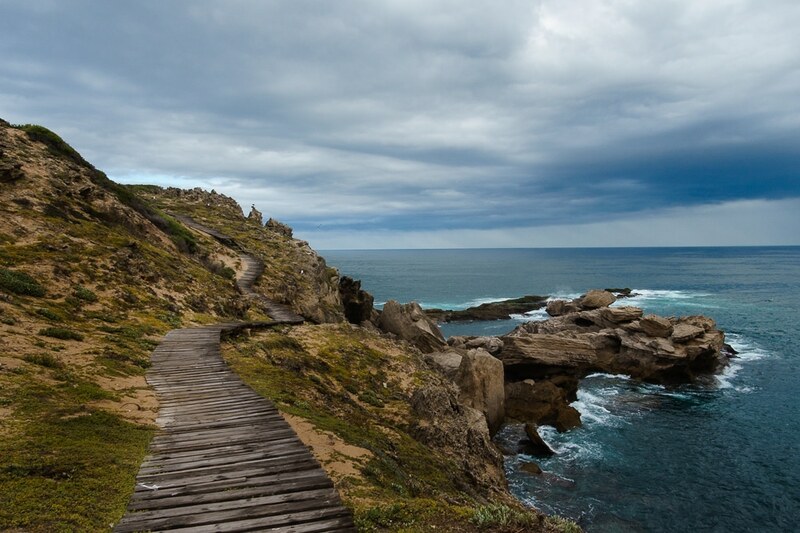 Whether beaches or a rugged coastline, the Garden Route never fails to delivery impressive views! Next PostNext We Are 2019 Granite Gear Grounds Keepers!